No worries buddy! The forum is here to ask and you can contact me anytime Does the issue persist or is the mesh finished? 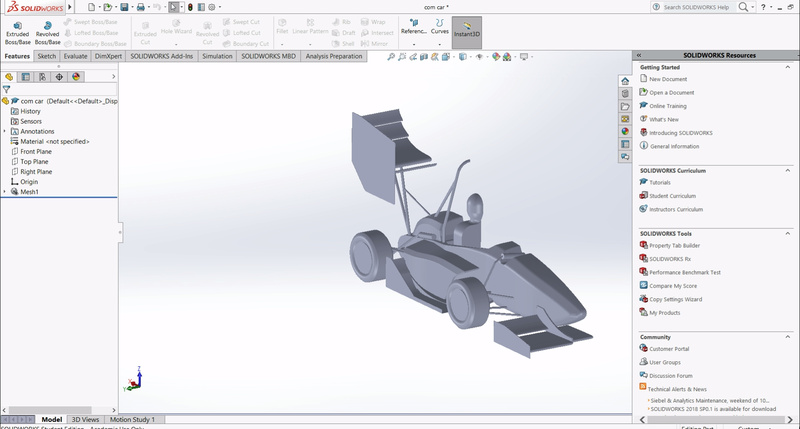 Tried making a wing, but with no prior experience in 3D modelling of a Formula Car facing so much difficulty. If anyone can just share their Geometry file (if allowed by SimScale Moderators) than it would be of great help. Using the script I still wasn’t able to but I tried the text editor I was able to do it! Don’t know what’s the difference but it worked. Anything else I’ll say, thanks! I have been trying to upload my geometry to simscale but it says "Your file could not be processed successfully. Please check the file format and try again. "Can you please help me with this?.I used the merger file. My onshape file link is https://cad.onshape.com/documents/16cdc543d387fe8a32a8507e/w/a1cd30e83c5238e00861ce57/e/ad90b03294631a33532aa2ed . Tmrw is the deadline,I’m afraid I wont complete the simulation. @jousefm the mesh has finished happily so i’m going to have a good go at the simulation. I’ll let you know how i get on with it. Exported your wing as STL and worked so far. Can you try using the text editor and merge your parts by hand (CTRL+C -> CTRL+V)? Let me know if that worked. I’m trying it now.I’ll let you know the progress. @jousefm @syedak47, sure! on my profile, you can find the latest homework assignment, feel free to download the geometry. By the way: the goal was to improve the downforce of the frontwing, which this assembly is not able to provide (just less drag). However this could be probably easily changed by adjusting the angle of the flaps. Is it necessary to run another simulation with other angle of the front wing? In addition the mesh is not ok. I guess it is because of the flaps inersecting with the plates. Hello! I cannot download the reference geometry or the reference wing, how can I overcome this problem? Hi juusefm, I’ve tried many ways to do the assignment but all failed especially in merge part( those .stl files ) can I apply for the extend deadline for the session 4? I am afraid I cant finish that on time. Let’s see if @drodriguez32 agrees. Will have a look at that a bit later. Let me know if you managed to overcome this issue in the meantime. Everything is explained in the tutorial. You can use whatever CAD software you want to use it is up to you. Feel free to contact me if you need help. Hello, I tried both merging methods and only the front wing is showing but not the car, probably the same problem with Kowalski. I get the same message “a facet normal problem was found on one of the facets. Check your STL file” when i open the car model. I am using SolidsWorks as well. Tried with the text editor too.Same problem exist.Can I get some assistance regarding this issue?Or can you help me getting another geometry so I can simulate and meet the dead line. Simscale web is not working, I can not do nothing. No log in, no new projects, no edit the projects, etc.